If Tony Easley doesn't wind up playing professional basketball somewhere it's easy to imagine him as a stand-up comic. He is certainly one of the more engaging and fun loving young men you'll ever meet. And although he's from Alabama he doesn't have the typical slow southern drawl. Easley grew up in Aubirn, Ala., the heart of football country. Naturally, Easley was an Auburn Tigers fan and not just because he grew up there. His uncle, Terry Walker played football at Auburn when Bo Jackson was there. And his father ran track for the Tigers while Harvey Glance was there, setting several records in sprint relays. Easley started playing basketball when he was in fifth grade. At 6-9, Easley is one of the tallest players on the team but that wasn't always the case. After playing seventh grade basketball Easley was cut as an eighth grader and again when he was in the ninth grade. It paid off as Easley made the junior varsity when he was a sophomore and finally made the varsity when he was a junior. “My high school coach was Frank Talbert,” Easley recalled. “He was like a father on and off the court. He taught me about basketball but he also taught me how to be a man. Easley played at Auburn High School as did former MSU star Aubrey Reese. In 2004-05 he averaged 15 points and 10 rebounds. He notched one triple-double with 15 points, 10 rebounds and 10 blocks against Smith Station. At year's end AHS was 30-7 after winning the state Class 6-A championship. Following the season Easley was named to the Alabama senior all-star team. His defensive play sparked a 16 point second half comeback in an 84-79 win over an all-star team from Mississippi. 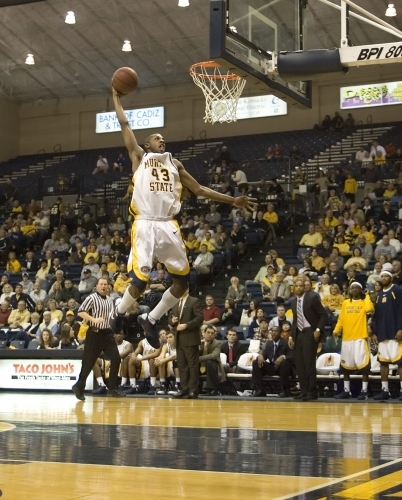 Easley was recruited by a number of schools in addition to Murray State. Tennessee Tech, Samford, Jacksonville State, Alabama State and Alabama A & M all coveted his services.